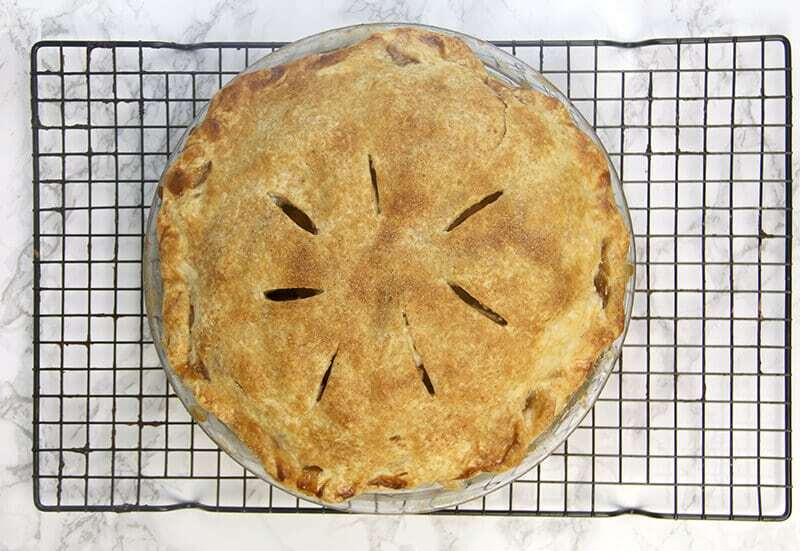 This easy double-crust apple pie recipe will become a classic for your recipe box. The filling is luscious with a hint of cinnamon and lots of apples! Doesn’t fall seem like a harbinger of good, homey, comfort foods? I adore spring and its light vegetables, and summer with its abundance of fresh produce, like juicy, ripe red tomatoes and buckets of squash and zucchini. But autumn wafts in, day by day, with little hints of coolness in the late summer evenings and then all of a sudden you see golden leaves dropping from the trees and then before you know it there’s a pot of this amazing chili on the stove because COLLEGE FOOTBALL! I love all the seasons but fall may just be my favorite. I can hardly wait to have the first fire in the fireplace! Are you like that? Do you long for sweaters and cozy blankets by the fire and soups and stews? 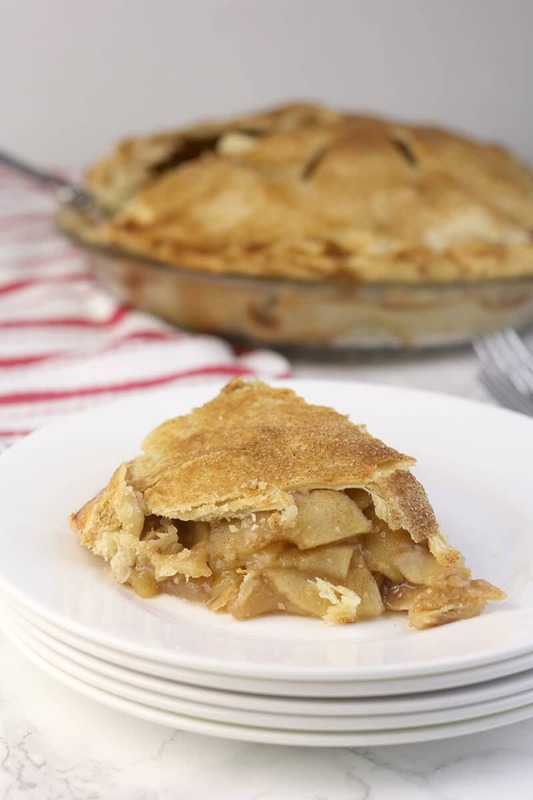 Well, let’s start with a favorite fall classic: Double-Crust Apple Pie. For something that should be so simple, Apple Pie has been the bane of my existence for the last three years or so. I’ve wanted to post this pie but every time I made one something just didn’t turn out quite like I wanted it to. Meanwhile, all around me, people who are not food bloggers obsessing over every little detail—like grandmothers—those people were making these beautiful, perfectly imperfect apple pies that everyone devoured. That’s where we are now. I read so many articles and tips for apple pie: Cook the apples first. Don’t cook the apples first. Use flour. Use minute tapioca. Cut the apples a certain way. Refrigerate the dough. Freeze the dough. And by the way, try my recipe for pastry dough which I borrowed from Mitchell Davis of the James Beard Foundation. It’s fabulous and foolproof. But if you don’t have time to make your own then refrigerated pie dough is just fine for this pie. 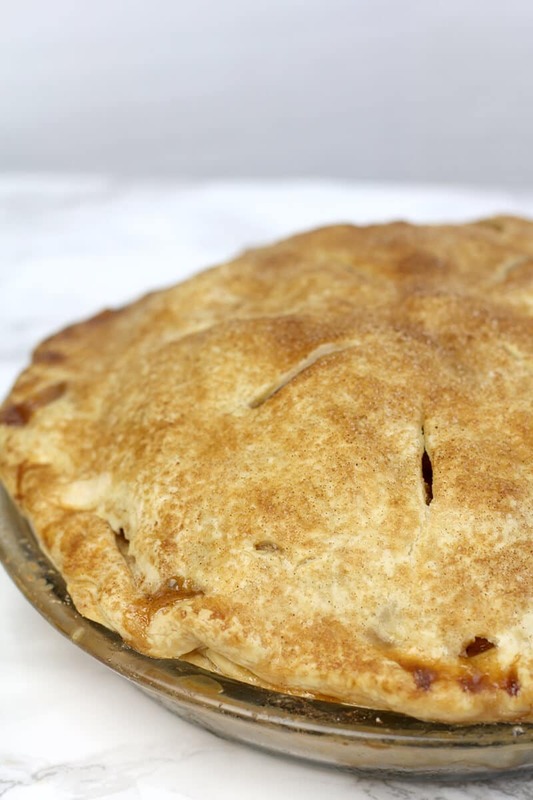 You can literally come up with a list of at least 100 different tips to make the best apple pie. I finally gave up. I couldn’t keep up with what tips had worked and what had not and what was left to try. I put the notes away and just made apple pie. And whether you want a Double-Crust Apple Pie, or a Lattice-Topped Apple Pie, or a Dutch Streusel Apple Pie, you can probably do the same. Don’t over-think it. It’s not rocket science, Lucy. It’s just pie. I like to start with a mix of tart and sweet apples, usually Golden Delicious and Granny Smith. I peel the apples and slice them thinly, then add a little lemon juice, minute tapioca, cinnamon, nutmeg, and sugar. That’s it for the filling—nothing fancy at all! Then when I place the apples in the dish I add some dots of butter and I like to sprinkle graham cracker crumbs in the bottom of the dish to help absorb moisture. Sprinkle a little flour on top of the apples, slap the top crust on, and bake. Be sure to cover a baking sheet with foil to bake this pie on, because some juices will overflow and that can make the biggest, stickiest mess. I inevitably miss a spot when sealing my crust, or break the crust somewhere, and end up having juices flow like lava. And the pie is still ok. 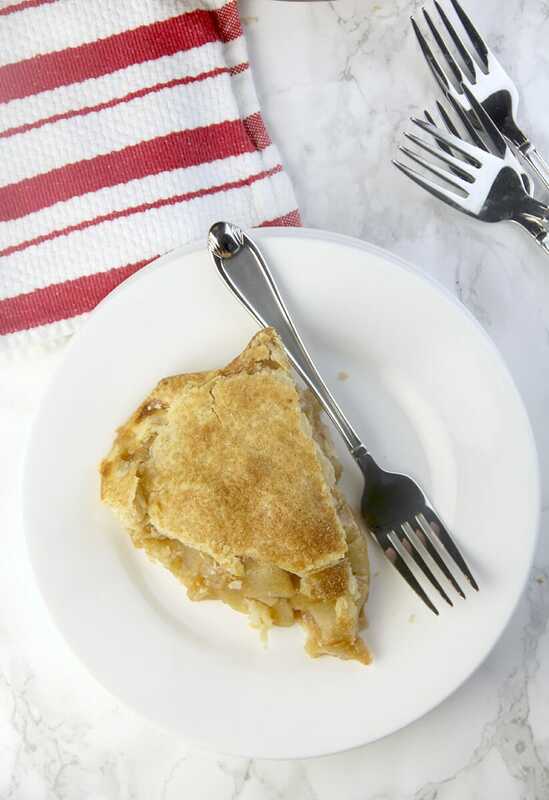 Simple, classic Double-Crust Apple Pie with a hint of cinnamon and nutmeg and sweet apple filling between two flaky layers of pie crust. 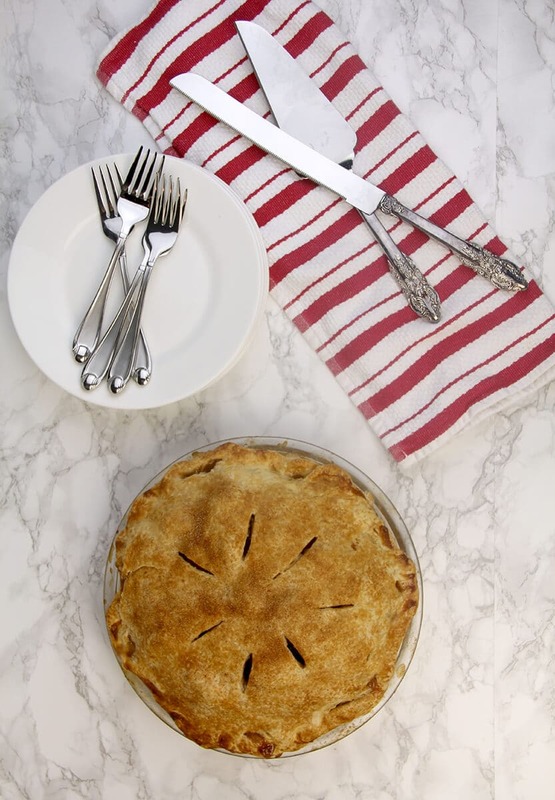 This pie has been a family favorite for generations because it’s delicious and easy. Preheat oven to 425° and place rack on lower third position in oven. Cover a baking sheet completely with foil. Roll out pie crusts and place one in pie plate. Place the other on parchment paper and put both crusts in refrigerator. Stir together 1 teaspoon of sugar and 1/8 teaspoon of cinnamon for the glaze and set aside. 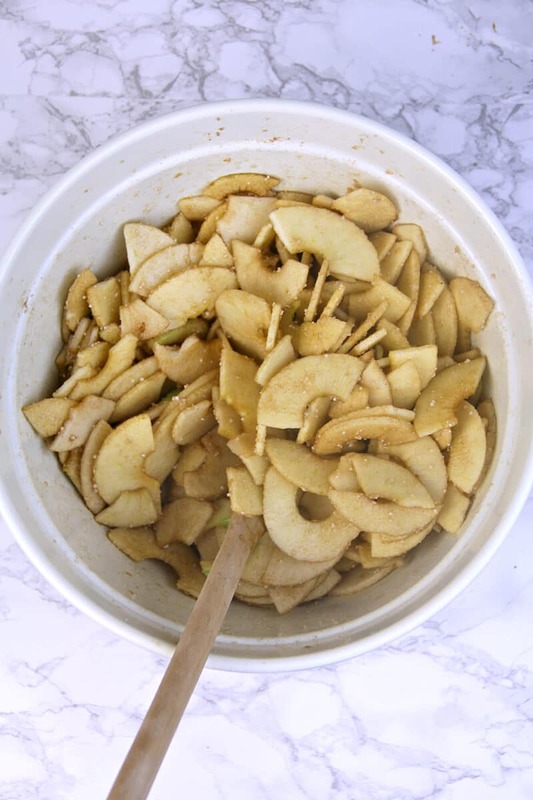 Peel and thinly slice apples into a large bowl. Add lemon juice and gently stir. Add tapioca, cinnamon, nutmeg, salt, brown and white sugars, and gently stir to mix. Set aside. Remove pie plate from refrigerator. Sprinkle graham cracker crumbs around the inside of the crust. Using a slotted spoon, place half the apples in the dish and dot with half the butter. Spoon remaining apples into dish and top with the rest of the butter. Sprinkle with 1 tablespoon flour. 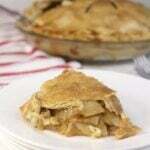 Place the top crust over the apples and trim1/2-inch beyond the edge of the plate if needed. Fold the top crust over the edge of the bottom crust and seal together. Crimp the edges with a fork or your fingers. Cut slits in the top for steam to escape. Brush the top crust with milk and then sprinkle the cinnamon sugar over the top. Put the pie on the baking sheet and place in the oven. Bake for 25 minutes, then turn heat down to 375° and bake another 30-40 minutes, until the pie is deep golden brown and the juice is bubbling through the slits. Let pie cool on wire rack until filling has set, at least two hours and preferably more. Serve at room temperature. 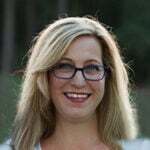 Thanks, Holly! See you soon!